What is The Miscarriage Association? The Miscarriage Association is a registered national charity which provides support and information to those who have lost a baby in pregnancy. It works to raise awareness of pregnancy loss and the issues surrounding it. 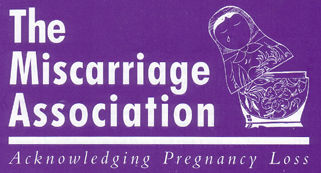 Founded in 1982 by a group of women who had suffered miscarriage, The Miscarriage Association today co-ordinates a network of over 200 volunteer telephone contracts and 50 support groups throughout the UK. If you or your partner have had a miscarriage or ectopic pregnancy and would like to talk to someone, we can put you in touch with a volunteer in or near your area. Almost all of our volunteer telephone contacts have had personal experience of pregnancy loss. We can give you details of your nearest support group, where you can meet others who have experienced pregnancy loss. Our Special Register may help us to put you in touch with someone who has had a specific problem around pregnancy loss, such as recurrent miscarriage, later loss or ectopic pregnancy. We publish leaflets and fact - sheets about miscarriage and ectopic pregnancy, including what is currently known about possible causes and different treatments available. We can provide information on specialist hospital provision of services relating to pregnancy loss. We produce a list of suggested reading and keep information on articles and research findings related to pregnancy loss.